A ready-to-eat, toasted breakfast cereal high in protein and fibre. High in protein. High in fibre. 27% of your daily protein needs per 50 g serving. GL tested. GMO-free. 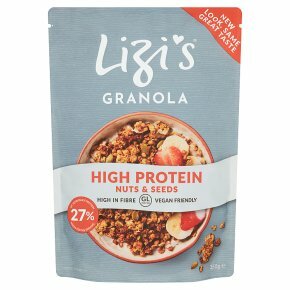 Suitable for vegetarians and vegans.GL Tested All Lizi's granolas are GL tested. The glycaemic load (GL) per serving is measured by an independent laboratory using internationally recognised protocols. Ready to eat with milk, fruit juice, yoghurt or add to fresh fruit. Use as dessert topping or eat straight from the pack.